Bright and colourful with the best features around! Fun Packed Super Size Chauffeur Car! 16 Seater Limousine With Great Features! Ford 4x4 With 16 Seats! Two Styles Of White 4x4 Available! Great For Weddings, Proms And Airport Transfers! The Limo People's range of 4x4 limos offer the perfect Hummer hire experience for special occasions in Cardiff, Barry and Caerphilly at very affordable rates. Our stunning range of stretched 4x4s are built by the finest coachbuilders in the US and the UK, and are all kitted out with lavish interiors that include leather seating, colour changing lights and amazing audio systems! Our larger 4x4 'Hummer' style limousines are licensed for upto 16 passengers per journey - perfect for a hen night or school prom! Cardiff is one the UK's top destinations for those looking for a great night out. With plenty of bars and clubs to be found in the city's West End and Charles Street areas, along with a growing number of venues in the new Cardiff Bay development visitors will find something to suit their party plans. 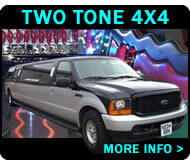 Our 4x4 limo 'Hummer hire' service will get your night out kickstarted before you even arrive in town! Step aboard, pop open the bubbly and put your favourite tunes on as we chauffeur you in style and comfort. As your evening draws to a close your driver and limousine can be on hand to take you home afterwards, ensuring that noone gets left high and dry after a great evening! 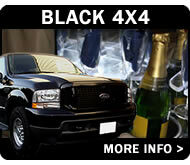 16 seater 4x4 in black! 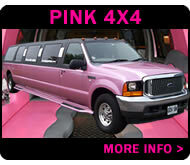 16 seater 4x4 in pink! 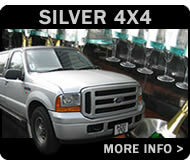 16 seater 4x4 in silver! 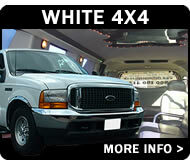 4x4s in white with upto 16 seats! 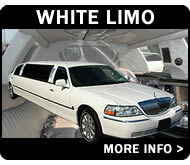 8 seater white Lincoln Town Car limos with choice of light or dark interior styling!!! Our cars are available for hire in Cardiff, Cardiff Bay, Barry, Barry Island, Dinas Powys, Cowbridge, Merthyr Tydfil, Pontyclun, Trowbridge, Caerphilly, St Fagans, Porth, Aberdare, Llantrisant, Tonyrefail, Sarn, Aberkenfig, Penarth, Treharris, Bargoed, Blackwood, Hengoed, Gelligaer, Usk, Llandow and Pontypridd. Get a quote today by calling our bookings office on 0845 260 2061 or complete the 'quote for hire form' and we'll get back to you with details on rates and car availability. 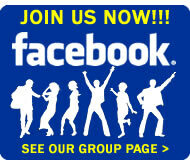 If you have a quick question please use the 'quick enquiry' form. Allow us to add some extra sizzle and sparkle to your party plans!